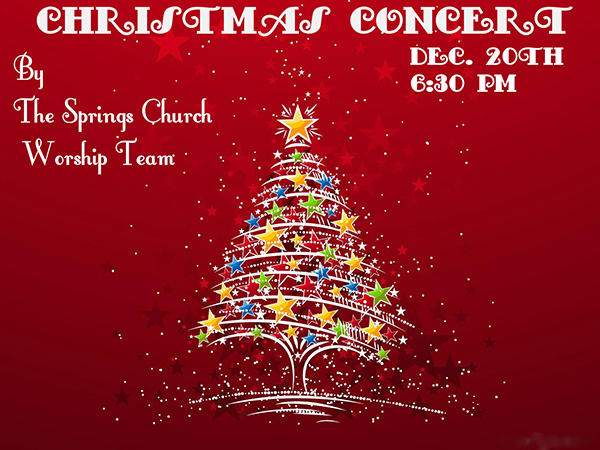 The Springs Church Worship Team is hosting a Christmas Concert at The Springs Church, 135 N. Grant Street, at 6:30 p.m. on Saturday, December 20. You will hear some of your favorite, fun Christmas songs and experience some great entertainment for the whole family. Let us help get you in the Christmas spirit! All proceeds will go to the church’s Bless The Children ministries to help kids in our community with clothing and other needs. Tickets are $3 a person or $10 a family. 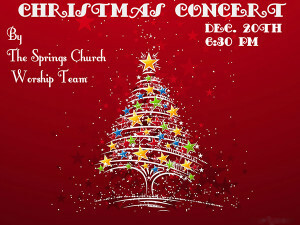 For more information please call the church office at 696-2970. Don’t miss out on this wonderful Christmas event!